and Advanced Scan is recommended to recover highly corrupted Outlook PST files. After this, Outlook files are previewed. This gives users an advantage to view these files in Windows Live Mail and Outlook respectively. Outlook PST Recovery software lets users recover entire Outlook PST data along with attachments embedded for each Outlook file. It previews all emails with their linked attachments during the recovery. Original styling, formatting, and all metadata information like To, Cc, date, subject of emails remain intact after users repair and save .pst files. Thus, all email items are previewed with all the attributes. Users have a privilege to select the email items that they wish to perform PST Recovery on. Outlook recovery software allows users to either export or repair corrupt PST files selectively on in the batch process. In case, the user is dealing with too large files, it can be broken into small fragments for easy usage by clicking on Split PST option. User can create PST files of the same size from 1 to 45 GB and manage data more easily. Can I repair PST files of ANSI type using this Outlook PST recovery software? Yes, this software repairs Outlook PST files of both ANSI and UNICODE type. 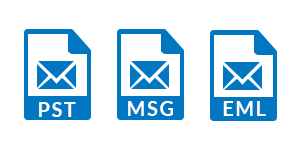 Does this allows to save PST files in MSG file format? Yes, this Outlook PST recovery software allows users to save the recovered file in different file formats like EML, MSG, etc. Is Outlook installation in my system mandatory to repair corrupt PST files by this tool? No, this tool works well even in the absence of MS Outlook. It gives access to PST files without the installation of Outlook. Does this Software give an option to recover permanently deleted emails from PST files? Yes, you can recover hard deleted items (emails, contacts, calendars, tasks, notes) from PST file using our Outlook PST Recovery tool. I have large file which may take a lot of time to process. Is there any option to break the size of the files into small fragments? Yes, Split option is an exclusive feature made by this Outlook Recovery tool for this kind of issue by which user can easily divide large file according to its size. Outlook PST Recovery is amazing software it designed for both technical & non-technical users. A few days ago my Outlook data file become inaccessible I don't know how then I used this tool to recover PST files. After working with the software I can say this is one of the best tools to fix damaged PST files. It also allows to stores recovered files in different file formats such as EML, PST, MSG, etc. The PST Repair software works for me to fix damaged PST file, I appreciate the workability of this tool, it not only for repairing corrupted Outlook PST file, it also supports the retrieve data from hard deleted PST. This software is a one-stop destination, which comes with all the implicit features for every type of issue that might arise while repairing Outlook PST files.